Kids love exploring and experiencing cause and effect. Last spring we had fun creating fizzing sidewalk paint where the kids and I painted our patio with sidewalk paint made from baking soda and then sprayed the paint with vinegar, watching and listening to the sizzles and pops. This rainbow lava activity is an adaptation off of that morning. 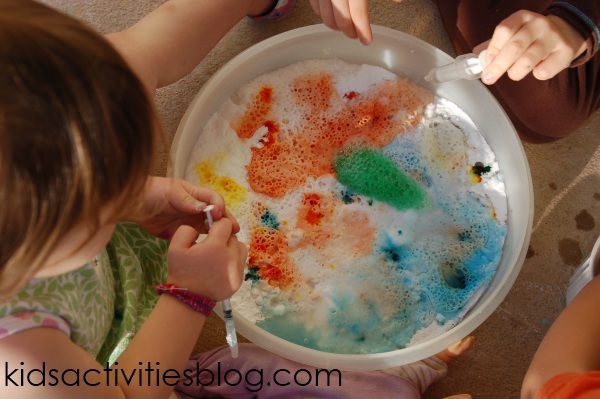 Baking soda, vinegar and dye – it is the perfect preschooler science project! We dripped food coloring into our tub and covered over the drips with baking soda. The drops were “hidden” by the sodium-bicarbonate – it looked like a snowy white field. After we had the colors adequately covered by the powder, we filled a cup with vinegar and grabbed some medicine droppers/syringes. It was so much fun to watch the colors emerge, pop and sizzle, from the white “space” of baking soda, eventually blending together. This is a great activity to explain chemistry and how some chemical opposites explode. Taste the baking soda, it’s salty (sodium – base), and the vinegar is sour (acid). A perk: When you are finished making rainbow lava – you can dump the mix down the drain it is a terrific drain cleaner – or you can dump it into your dishwasher to help get rid if the filmy buildup. We have a post with other homemade cleaners,many of them are based on baking soda and or vinegar. What science projects have your kids enjoyed recently? We have also used the same ingredients to make raisins dance in this Baking Soda Experiment. I love how you hid the food coloring under the baking soda! 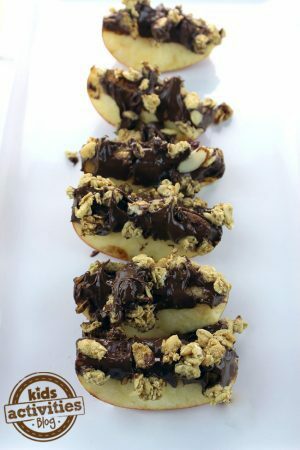 What a neat little twist to a cherished childhood favorite! Totally going to do this with my boys!!! Fun & informative! Perfect. Thanks for posting. 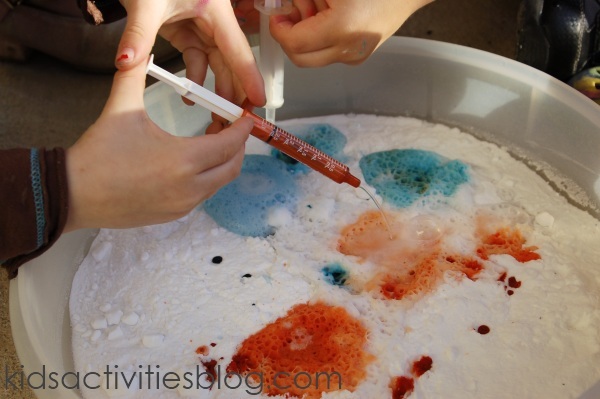 We will be exploring baking soda and vinegar reactions this week, and of course everything needs a little food coloring to make it even more fun 😀 Thanks for sharing. We did a little Science with Soap, first time for this group of kiddos and they loved it! Thanks for linking up to the Afterschool Party. I can already see all these little scientist coming home from school to experiment with activities like this one. My kids always love when I get out the baking soda and vinegar. Oh, yes, vinegar and soda never ceases to surprise and amaze. I like your take on it! Looks like a brilliantly fun experiment. Like all the colours!